Today, i've attended my USCIS Citizenship interview, from previous experience, this interview is focused on validating information submitted by applicant and fixing any errors or misspells, Correcting information and then submitting the documents for approval by the USCIS agent. 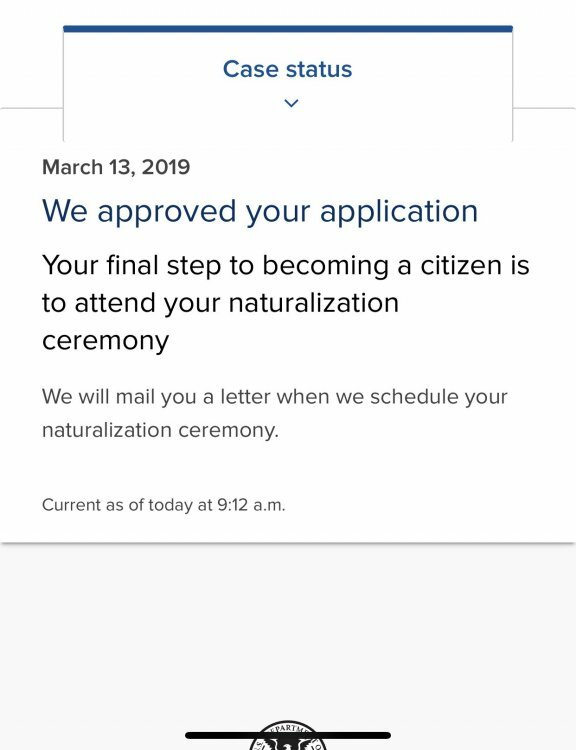 At 12:30 i arrived in the office of USCIS with the address above, handed my letter to the window lady, she welcomed me and asked me to wait till someone come and ask about me, i said thank you and waited like everyone else. After a while of waiting a lady comes open the door and ask my name, I smiled and turned off my phone, she asked for my ID, i pulled it off my pocket and we walked to her office, I mentioned that my 2018 Tax return paperwork is here and i would like to submit it into my files, She rejected it, said i have to Notarize it, Please understand that's not true, The paper is printed off IRS.GOV and no one ask for that yet i asked her if i can go today, do it and bring it, she refused. after asking me the first question if i was married, knowing that my application states that am separated, i hesitated in answering since the divorce was finalized days before attending my interview, i didnt have court Decree of Dissolution of Marriage yet, then out of nowhere, this lady started stating that i might be lying and that she will not accept any answer, i tried explaining that i am divorced yet she started shouting that she is Federal Officer and i will only answer her questions by Yes or No, i answered yes, i am Divorced, she stated that i dont have any proof and that i have to keep it as Married, not Separated or Divorced, Married. i didn't have a choice because she wont give me any chance to talk, When i open my mouth she reject and talk over me with no regard or respect, she was abusive and very angry!. i gave this lady the benefit of the doubt and just stayed quiet waiting for the next questions, every question she asked came with insulting violent demeaning attitude!, i am surprised! am stunt! what is going on here! she is attacking me and when i want to say anything she shout and threatening me to Reschedule my interview for later date, every time she ask me in an extremely rude way a questions, she do not take the answer, she is mad at me! she is treating me like a criminal who done something wrong! i didn't do anything to her! she is using the Law and Federal powers to torture me!, She refused to explain a question. Before i continue writing few focused points that shock me and stressed me, i would like to note that i have been living in the United States as legal Permanent resident for 6 years, In all of these years, i have followed the Law, Paid my taxes, Never been in jail or conflict, i have never violated traffic laws, I have ties to my ex-wife family, i am there every year and we all love each other and they want me to stay as part of the family as i do, i have clean record with every right to be eligible in this citizenship interview, This interview suppose to be easy clean respectful. With that been said, i have continued the interview, my chest started hurting me, my stomach is hurting me, i've never been talked to like this, i started shaking out of stress and she continues firing at me. We reached the point where i had questions about the history of the United states, i answered the questions and passed it, English reading and writing, i did answer those and passed, It came to the last question of " perform work of national importance " i said Yes, i would do it for this country, she said do you understand what it means, i said yes i would do anything for this country because i love this country and its my home, she interrupted me to say, I Didn't ask you that, i said okay please explain the question, she refused and said You're suppose to know that before you came in here! Am not here to answer your questions, You're here to answer my questions!. From what i've seen, she just needed a reason to make me fail in the test, she came true with her threat, with everything i endured, a letter to come again in 60 days. By then i realized her mind is set! she doesn't want to process anything for me, SHE HATES ME!, I asked her why are you doing this! She freaked out and started shouting that i've insulted her for asking that, it was unacceptable to ask that!, it was out of line and i shout shut up and only speak when spoken to!!!!! I was speechless, am in shock, she writes up stuff on her computer and then she asked me to stand up, i did, she said Stand in the hallway and i did, then follow me.. she escorted me outside, gave me a paper says that I Failed to "Understand English", that i will be given another chance, she said "You can go", Her name was Duhart S. as the paper says. Am not understanding what just happened, I had the paper and on my way out i realised that she can't do that, she is abusing her power so i turned back and went to the window, i asked to speak to someone about this lady, i wanted to see someone else and i want to complain about her!, on the window they asked me to wait till they call for me, i did, 10 minutes later the window lady said that 3 Supervisors are busy in a meeting, i can take your complain on a plain paper, that's easier for you, i refused to take that option, she said it will be 3 hours before anyone can see you, i said i will wait, am not going anywhere without complaining about Ms Duhart, she said alright, your choice. i thanked her and sat down again. 10 minutes later the Supervisor came over and i said my peace about how she abused me and disrespected me and "Abused her powers to make me fail", i requested to be interviewed by another officer, she said alright, have a seat. 10-15 minutes later Officer Carter comes in and invite me for interview, he was respectful, he asked me the questions with ease and calm, he showed me my application which Ms Duhart didn't, he showed me some of my application sections that been removed by her, she intentionally removed key points to delay my application, she sabotaged my chance of becoming a citizen, she removed my request to edit my name spelling and Officer Carter helped me fill it back again, He was professional about it yet it didn't help to get my approval recommendation, He answered my questions, he explained points and listened, That was what i expect from my interview. My friends, I have endured her demeaning, insulting, abusive rude yelling at me during the interview to avoid any delay to my paperwork, i have witnessed her deleting my request to edit my name spelling, she just removed it, without asking, she refused to listen to my voice, she refused to answer my questions, she accused me of being insultive. With no regard for accountability, She forged her result just to delay me and reschedule me! please advice me, I have written a small summary to the Office of Inspector General, a Report of Abuse, Mismanagement and Misconduct to the Department of Homeland Security, am not satisfied, i don't think this is enough. "Edit: While going through application with Officer Carter, All my answers about saying No to being in military, Jail, Offences, All questions that i said no to, were Deleted, No answer was filled, i've seen it from the iPad screen while the new answers are set right by Officer carter and Duhart answers were EMPTY." Uhm couple things: first, I am sorry for what happened to you. If that was true, that lady definitely violated her professional conduct at the very minimum and possibly more. 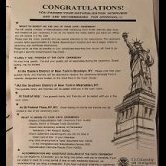 Did you apply based on 5-year or 3-year married to a US citizen? Cause if it’s 5 years, they have no reason to ask about the marriage. So what exactly happened at the end of the interview with Officer Carter? 5 years Eligibility, At the end of the interview, she asked me "If the law requires are you willing to perform work of national importance under civilian direction?" I answered YES. She said you know what it means, I told her YES. she said What? i told her Do what the government ask me to do for this country, She said NO, What is the meaning of this?, i said Do what required by law for this nation, She said NO, DO YOU UNDERSTAAAAAND the question! in a demeaning way, i said Please... explain to me. she refused to explain it, said You're suppose to know what does it mean, then started writing and printed that Failed to understand English paper, You will get a second chance it said. and done. She figured its the one thing i didnt answer right. I did google it while waiting outside for my interview, its simple: A person who, “by reason of religious training and belief,” objects to any type of service in the Armed Forces must promise only to “perform work of national importance under civilian direction.”. i would fight for this country if needed, i dont have religious restrictions. Got the answer in 10 seconds, she could have just said that line and i would given my same answer. Cause if it’s 5 years, they have no reason to ask about the marriage. They are permitted to review the entire immigration history. If the OP obtained any benefits via a spouse, then that is subject to review. But the burden is on them this time, not the applicant. Recent case of this happening and resulting in a denial and subsequent finding of a "sham" marriage (no action taken on that yet, though). That said, if what the OP stated is accurate then that IO went way overboard. Sometimes they are tough or even nasty in an effort to expose lies....but this is well beyond that. That said, if what the OP stated is accurate then that IO went way overboard. Sometimes they are trough or even nasty in an effort to expose lies....but this is well beyond that. I have lived in good faith with my ex-wife, we are still communicating and i still visit the family on holidays and every chance i get, i have the best brother in law anyone can hope for, i have supportive sister in law that loves to see me in Thanksgiving and christmas, i have mother in law that calls me from time to time to check on me as i do check on her, i have stated we were separated when i applied for the citizenship, i have stated we are divorced in the interview, i've been transparent about all my documents and always told the truth. this lady mind was set before i even met her. Sometimes you just happen to catch her on a bad day. I mean she’s human too. Maybe she just got divorced lol, I don’t know. What happened at the end though? The second officer didn’t say approval or anything? They just told you to go back and wait for a notice? Right now I know you’re angry and feel violated. However I don’t know if I would do anything right now. If they approve your naturalization, I guess there is no harm no found. I mean you file all the administrative complaints you can. But if they deny, I would get a lawyer immediately. You’re wise and most logical, I appreciate your reply as it did calm me down, i will wait for the update, Officer carter made me pass the understanding english section she faulted me with, had me sign electronically like am supposed to, i didn’t get the check box that says Congratulations you will be recommended, still i think its out of her hand to harm it now. Am relieved that I didn’t tuck tail and went home after she said did that, am glad to stand up to whats right and whats wrong. i will update this post once i get an case status change, thank you. Tomorrow will be a better day my friend. Congrats and you finally passed this terrible incident. I'm not sure if its true that they do record the conversation during the interview, well that's what I know because if they do then the first IO will really liable for what she did to you. I will vote in 2020! God Bless America! Congratulations!! I'm glad you to stuck to your gums and asked to see a supervisor (and stayed until you saw one) after the interview was over. It seems that all too often we hear of stories like this where the interviewee leaves without doing anything about it. Congrats, man. Sometimes, ya gotta pass through that final ring to citizenship. For some, that ring is made of gold and drizzled in honey and lavender, with little kittens and puppies running around. For others, that ring is made of fire and surrounded by angry wasps.